Much, almost everything, is different. Donald Trump is, by his electorate, endowed with more power than any President before him in modern America. 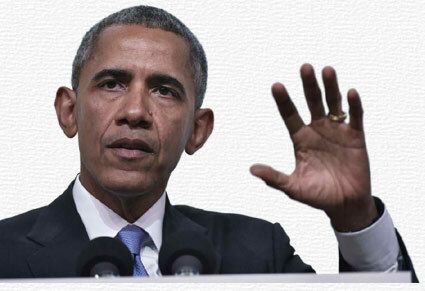 Barak Obama had to fight every single vote for new legislation and decisions. At Trump the opposite is the case. With him comes a man in the highest office of the Western world in 2017, who has an unquestionable majority of votes in all political areas. To be stopped, he can practically only from his own ranks. Trump will be recorded in a very small circle of initiates. And although chattering and ill-considered utterances characterize his everyday life, it is now his unexpected 'holy duty' to convincingly demonstrate to his political environment (and all of us) that all that now follows is coming from him self. There will be immense upheavals and changes. Not only in the USA. 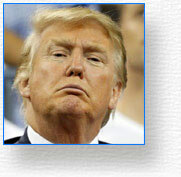 His policy, which is not really 'his' policy, will be epoch-making. Good for one, bad for others. In the end it is that the United States of America will be the most powerful (and leading) political institution on Earth in about 40 years. Commands from the future ...? If I did not completely wrong in deciphering the Nostradamus prophecies, then America's future is already history. And Donald Trump have now to learn that he has not been lifted out of pure coincidence (equipped with particularly great power and action effectiveness) on the world-changing US throne. 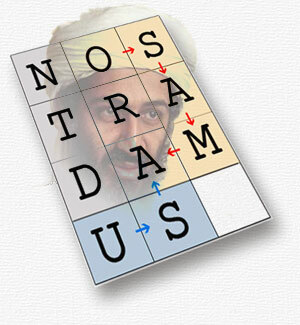 In 1994, when I first wrote his 'artist name' NOSTRADAMUS with three characters next to each other, I saw strange things: namely, the word "OSAMA" (color-coded here), behind which I suspected the island state SAMOA. Everything else did not make sense to me. (Osama bin Laden - that name came into our heads only seven years later.) Then, in the small table (blue fields), USA and in the middle vertical row (the letters ORAS, translated into numbers): 09. 11. 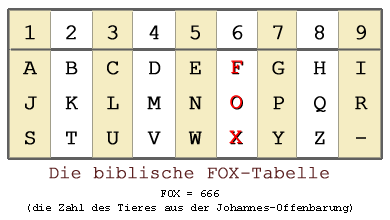 The transformation list (FOX-Table 666) can be found here. Think about the self made prophety now.  You know, his prophecy work been immortalized by a great songwriter from France. If you share the heritage of the celts besom, then you know the shining of lightning, that coming from eternity. The god Thor he stand at the heaven portal with a gameshow of light and bizarre fire. The prophecy in poetic form also reflected in this dapples thought as the reality of 143st versus the 276st quatrain. It is the fire from the powerful strobes. Pay attention, now comes it to the traces of the prediction vague. It is the dark word that whips mankind. The demonic language was eternally begin and finish of the truth. If you can solve this riddle, then you will quickly understand why the four-lineers of the Michel Nostradamus often sound a little broken and crazy. Anyone who encrypts secret messages in texts, he will - with this code - barely manage without language compromises. The future - not hidden here! The first edition of Centuries which had become world-famous, contained three complete Centurias, each with 100 four-lineers, as well as the Fourth Centurie with 53 four-lineers and the letter to the then 2-year-old son of the seer, Caesar. The edition was approved on the "last day of the month of April, 1555 by the Royal Council of Lyons, Hugues de Puis, Seigneur de la Mothe." The first editions of the libraries Albi and Vienna, which was been lost for a long time and have only been rediscovered in the last millennium, are, surprisingly, only apparently identical. 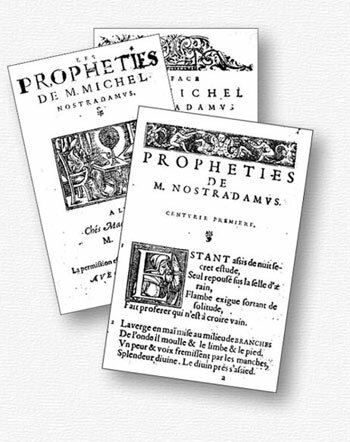 Some corrections in the Viennese edition prove that after the publication of the first edition (copy, library d'Albi) Nostradamus probably corrected the work with his own hand and then a new edition was printed (copy, library Vienna). Not insignificant, I consider the finding that some non-significant typing errors have been corrected, but big mistakes have been maintained. For example, Nostradamus' names the planet Neptune probably by mistake in a list of planets (but Neptune was discovered only in the middle of the 19th century and then got its name). Or that Nostradamus know the very irrelevant FID number of the library from Vienna (this is a stamped number from our time to cataloged the books in the Bibliothek - More about this in German language as a pdf file here to download).